Sleeping Beauty Castle-Disneyland Park: Disneyland Resort, Anaheim. Walt opened up Disneyland in 1955. 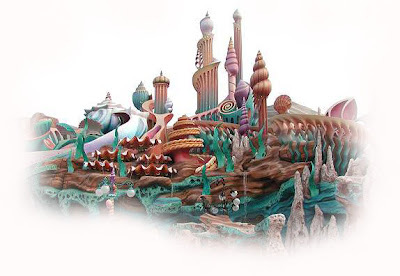 He was in production of a new movie to be called "Sleeping Beauty" and he decided to do a little cross promotion and make the icon of Fantasyland, the key feature from this film. Sleeping Beauty Castle as it's called... no apostrophe and no "s" eventually became the symbol not just of that land but the entire park and the company as well. 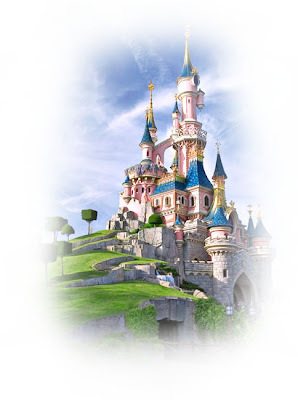 When most people think of Disney they either imagine Mickey Mouse or Sleeping Beauty Castle. Although it's changes slightly in the past fifty years it's still an amazingly timeless piece of architecture. 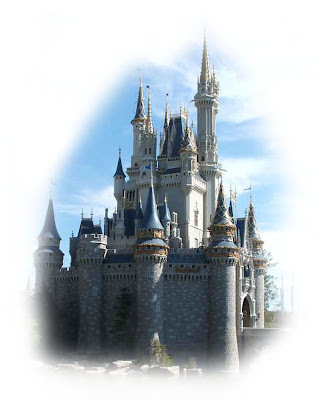 Cinderella Castle-Magic Kingdom Park: Walt Disney World Resort, Orlando. When the decision was made to go ahead with Disney World after the death of Walt, it was believed that the resort shouldn't just be a copy of Disneyland. It should take advantage of the land that was available and not make worry about the limitations that the California Park had had. It was decided that instead of having a small castle like the Sleeping Beauty one, a much larger, grander one would designed. This time the focus would be on another Castle from another Disney film... and the naming it after another Disney Princess, of course. Cinderella Castle-Tokyo Disneyland Park: Tokyo Disney Resort, Tokyo. Le Château de la Belle au Bois Dormant-Disneyland Paris Park: Disneyland Paris Resort, Paris. Le Château de la Belle au Bois Dormant or just a looooong, fancy way to say Sleeping Beauty Castle in French... When Michael Eisner was yet to be burned by Euro-Disney he was in an extravagant mood... this was his "surprise me" period. Before the fall. 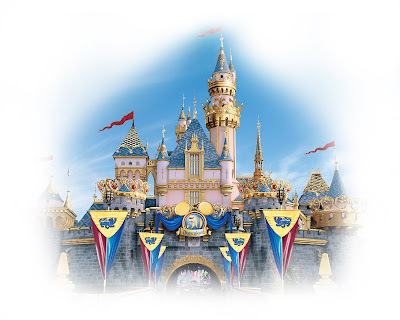 Anyone that reads this blog regularly knows that this is my favorite Disney castle. It evokes the world of a fairy tale set in Europe while maintaining a very Disneyfied view of the way one should enter Fantasyland. Imagineer Tom Morris came up with a wonderful design for the castle. 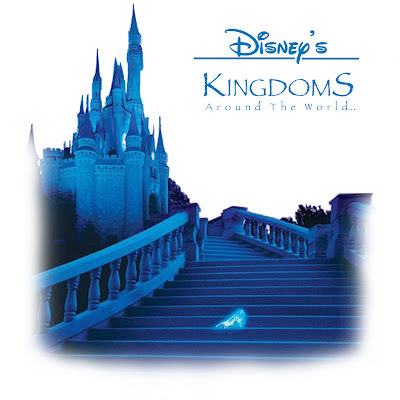 Tony Baxter and his crew came up with a design for the park and castle in particular that made it stand on it's own versus Anaheim, Orlando and Tokyo had. Of note is the stunning displays of handcraft in the gallery, the stained glass windows created by Paul Chapman are simply enchanting. 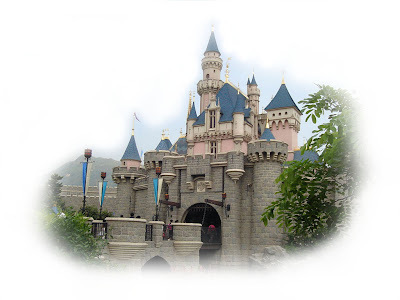 Sleeping Beauty Castle-Hong Kong Disneyland Park: Hong Kong Disneyland Resort, Hong Kong. When the Walt Disney Company decided to place a park in China it chose not to come up with a new design for a castle but to do the opposite of Tokyo. 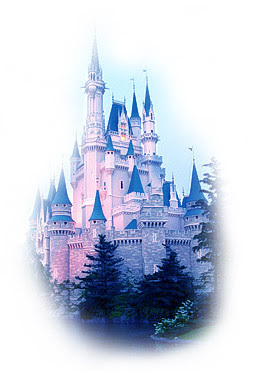 Where the Japanese Resort played on the Magic Kingdom's castle, Hong Kong's would be a homage to the original in Anaheim. With only slight differences it is an exact copy of the design here in California... the biggest difference isn't one of the small design changes. It's the view. It's as if someone took the original castle and placed it in front of a series of picturesque mountains. The Hong Kong castle, like the park itself is layered in typical Disney details... the difference between the castle and the park is that the castle was built in the right size. The park unfortunately was not. King Triton Castle-Tokyo DisneySEA Park: Tokyo Disney Resort, Tokyo. Why am I including this one? Well, because it IS a castle. A Disney castle... and a very unique one at that. The detail it has is wonderful. It's been argued that the Imagineers should have made this the center of the park instead of Mount Prometheus. While I love Prometheus, I think it would have been a great centerpiece. Walking around the castle, particularly at night makes you feel transported into the classic film. All of these castles reflect the differences and cultures of the areas they exists in. I happen to like that each one is different, even if it's only slightly... it gives a Disney Geek a reason to visit each. I don't want the park to become nothing more than cookie-cutter representations of each other. It's like five sisters that each have their own qualities to excentuate. What fun would it be if all five were exactly alike? Here that Jay Rasulo? Let's hope that the recent departure of some of Jay's underlings only quickens his own departure. Otherwise the next castle we see will be a carbon copy of what we already have now instead of say... Beast Castle from "Beauty and the Beast" or "Snow White" or even Prince Eric's castle from "The Little Mermaid". Let's hope in a year or so Matt or someone like him that understands this takes over. I also love the DLP castle. It is amazing. Especially the Dragon beneath it in the dungeon. There is so much detail. I only wish the WDSP had a fraction of the detail that the castle and park next to it does. How is it Paris has the most beautiful park AND the ugliest park? King Triton's Castle is great. If they ever build a DisneySea in America it would be a good thing to make it the center of the park. Who knows, maybe if that Hawaiian Resort does well when it opens and enough people ask Disney for it, they'll decide to expand and build a DisneySea park there with a couple new hotels and turn it into the Port Disney that California lost out on. HEY There are many French tourists who go, for the name of the castle of the beautiful to the sleeping wood there you are not intelligent to know that English and French dont have the same words!!! Imbécils who ignore! !